Did you let your pot of chili sitting on the stove a little too long? First time cook rice and have the flame too high? Accidently leave your kettle to boil over when you go to do other chores? We have all experienced it, the staring at your once shiny silver pot now covered in black scorches, with all those precious food still stuck on. Sure it's fine if you are the only one at home, but if you to have to face your spouse over the burned food, or worse, borrowing your a friend's kitchen for a dinner party, you are in for a lot of trouble. How to clean burnt pot? Well, there isn't really a need to be a cause for panic, or escalating it into a huge fight. Next time you are once again staring dejectedly at the bottom of your burnt pot, give the following methods a try. While you can immediately try to scrub those black soothes off, you are going to face a lot of trouble doing that. Your first step should always be soaking the pot in hot water. Either have it straight from your tap if you have one available or boil a kettle of water, more as needed. Pour in the hot water until the scorched marks are completely covered. This will not affect the scorched marks in any way, but it does loosen the burnt on food stuck to the bottom and sides, lifting out some of them. Drain the water and try to scoop all the loose pieces. With this, you will have to deal with less food later on and focus on the actual burnt in the pot. Consider adding a little squeeze of dishwashing liquid for better effect. Better quality cleaning products lead to less time to clean your burnt pans and pots. Liberally add a considerable amount of dishwashing liquid to your pot. Pour in water until the entire scorched area of your pot, plus an inch or two extra. Using hot water here will help, but not necessary. Grab your scrubber and gently scrub the affected area. 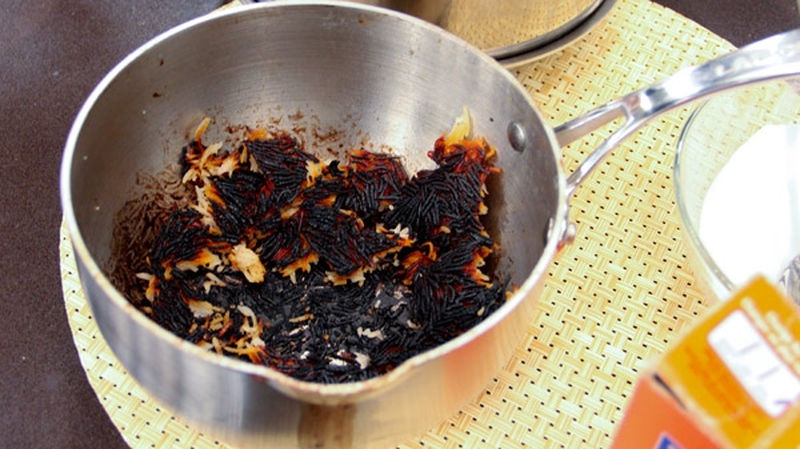 The burnt marks should be removed easily if the pan is soaked enough. For those stubborn scorches that won't come off with dishwashing liquid and some scrubbing, you will need to put in additional effort to deal with them. For stainless steel pot, the best ingredient that never fails to clean those pesky burns is baking soda. Mix baking soda with water to a pasty consistency, sort of grainy and thick. It won't work as well if it's runny, adjust the amount until the desired result. Apply the paste and cover the affected areas. Leave it for an hour or so. Afterwards, give the scrubbing another try. Those stubborn stains should come right off. Try using this paste for other stains when cleaning your household! It is really important to know when you are trying to clean burnt stainless steel piece of any kind, never let it near any wire scourer or steel wool. Doing so will just scratch the pot beyond recognition and you end up with a new problem. As such, your high-quality stainless steel should only be scrubbed using cloth or soft sponges. The baking soda paste mentioned previously is mildly abrasive itself, so the least thing you want to is doubly aggravate the material further. For pots with different materials or the ones that you are going to dispose of sooner or later anyway, steel wool is perfectly fine. In fact, scrubbing is the fastest way to get rid of the burnt scums off your pots but always stick to wiping with gentle materials when dealing with stainless steel to protect it. Finally, just rinse everything off and wash your pot as per normal. The dishwasher liquid and scrubbing should do the job and if you are satisfied with your result, all you need is a final wash. Stick them in the dishwasher if you like, it just needs a quick rinse to make sure all the remnants are completely gotten rid of. Enjoy your as good as new pot again. That is how to clean burnt pot in general. If you have no access to hot water for some reason, leaving your pot in the freezer for a few hours can be surprisingly effective. Pop your pot in the freezer, as the burned food gets frozen, you will have an easier time peeling the remains away. Note that this tip is only to deal with the burnt food, not the scorched marks itself. The lemon and salt combo is excellent to remove stains and odour from wooden and plastic cutting boards, but also effective for scouring pans and pots. If you are dealing with burnt baking sheets, this technique will make your time so much easier, since the flat area provides better scrubbing surface. Cut the lemon in half and sprinkle the salt on the opened half. The salt will work as the surface scrubber while the acidity of the lemon will provide the dishwashing liquid like properties. Similar to lemon, the acidity of the vinegar will work wonders to remove any stubborn marks latching onto your cookware. To use the vinegar to clean, soak the stained stainless steel pans or pots in two cups of white vinegar for around half an hour. Scrub gently and rinse them off with hot, soapy water. Give it a final cold-water rinse and dry your pan. The humble ammonia gets a ton of uses for cleaning your kitchen, and they are magical for dealing with terribly burnt pans or pots. All you have to do is pour a cup of ammonia in a sealable plastic bag, along with your scorched pans and pots. Let is sit overnight. The next day you will find those offending scum will come right off with a little scrub. Remember to be exercise caution when working with ammonia. The chemical is fairly harsh so it is important to open the window and protect yourself with rubber gloves. Server responsed at: 04/23/2019 12:53 a.m.